A Limerick school at the centre of controversy over the practice of religious education has agreed to allow a student opt out of the subject "with immediate effect". The matter was considered at a board of management meeting held at Castletroy College this evening. After the meeting, members of the board declined to speak to waiting media but the school subsequently issued a very short statement. The student will not be required to study religion, but she will have to remain in the classroom while the subject is being taught. The school said the child's parents had been informed. Earlier, the girl's father, Paul Drury, told RTÉ News that neither he nor his daughter were religious and that his daughter did not want to study the subject. Mr Drury, who is from the UK, has welcomed the decision. He said he was surprised to be told last week by the school that religion was a mandatory subject and that it was not possible to opt out. The law states that schools cannot require a student to participate in a subject that goes against their or their parents' beliefs. The Constitution also gives parents the right to withdraw their children from religious instruction. Mr Drury said he had thought Ireland was a fully secular society and it was wrong and backward to oblige children to study religion if they did not want to, especially in a State-run school. 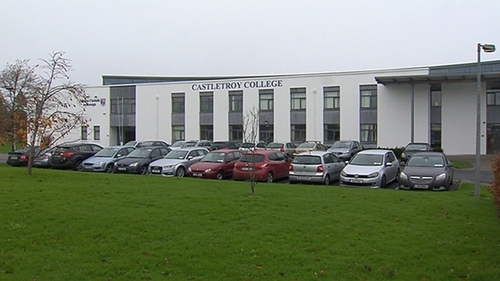 Castletroy College is Limerick city's newest school, having opened 15 years ago, and has more than 1,000 students. The school is run by the local Education and Training Board (ETB) – formerly the VEC – and the local Catholic bishop is a joint patron. The school confirmed that Mr Drury had been told his daughter could not opt out of religion. School principal Padraig Flanagan said that over the years a number of parents had made approaches asking that their child be exempted from attending religion class. However, he said those parents had always accepted the subject when the school explained that it was a Junior Cert exam subject and was for "all faiths and none". The National Council for Curriculum and Assessment says Religious Education for the Junior Certificate allows pupils to "explore how many religions, particularly Christian religions, have shaped the Ireland you live in today" and that at least one of the major world religions will be studied in detail as well as "how different communities of faith organise themselves". All ETB schools are obliged to teach religion. This was a stipulation that the Catholic church made to the State during the development of the then-VEC school system. ETB schools can opt to teach religion as an exam subject if they wish. Mr Flanagan said the school tried to be pluralist and inclusive. He said it was now going to have to reflect on this issue and that it would be resolved. He also said he was not aware of any ETB policy or guidelines to deal with students who wished to opt out of religion. Mr Drury has called for policies to be drawn up to enable children to opt out of religion classes and called for religion to be treated in the same way as many other subjects and offered to students as an option. One third of all second-level schools in Ireland are run by Education and Training Boards. The ETB this afternoon confirmed there is no central policy or guidelines on how schools can enable students to opt out of religious education. It said each local ETB is a separate statutory body and runs its own affairs. ETB General Secretary Michael Moriarty said schools had to balance the wishes of parents against other demands, but accepted that parents had a legal right to have their children not study the subject. Minister for Education Jan O'Sullivan this afternoon said parents have the right to decide whether or not their children attend religious education classes in their schools. She was speaking in Limerick, where she was asked about the case at Castletroy College. She said she has had some "brief discussion" about the case with the ETB which runs the school, and suggested the matter was likely to be resolved to the satisfaction of Mr Drury. "Clearly I believe parents do have rights for their children not to attend religious education should they so wish," she said.